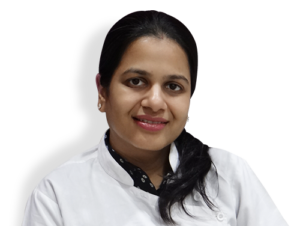 With an ideally excellent academic background, Dr. Shweta is known for her achievements in her tenure as a student and a successful cosmetic dermatologist. She is an M.B.B.S doctor with degrees viz. DVD, MD and DDV as well as FCPS and DNB. She possesses an eminent experience as house-officer, resident doctor, and an independent doctor in renowned medical institutions like Dr. R.N. Cooper Hospital and Kaya Skin Clinic. She has earned major certifications in cosmetology procedures like Botox, fillers, cheek augmentation, lip filling and nose agumentation. She has worked as a key dermatologist as well as a consultant. She has more than seven accreditations in the implementation, structuring and design of oral and poster presentations made in her name. She has also been an active participator and contributor to a number of national and international conferences of dermatologists. She has even conducted numerous cosmetic treatments in her professional tenure. Her services at Allure MedSpa are crucial to those looking to be transformed from “fine to fabulous” and this has been reaffirmed with a number of successful outcomes. The various dermatological procedures have won confidence and hearts of her patients, who have the highest expectations on her professional skill. “Evalution of utility of 88% phenol in Alopecia areata” A Desertation Scientific research society meeting, Mar – 2005 LTMMC & LTMG Hospital. “Evalution of utility of 88% phenol in Alopecia areata” poster presentation 33drd National Conference of IADVL, Feb- 2005 Delhi. “Blastomycosis like pyoderma and Amniotic band syndrome”Free papers Paediatric Dermatology conference , Nov- 2004 Chennai. Maharashtra branch, oct- 2004 LTMMC & LTMG Hospital. CME on HIV, June -2004 Holy Family Hospital, Mumbai. persitent papillary membrane.” poster presentation Annual Meeting IADVL Maharashtra branch, Jan-2004 Nashik. “Chloracne in a family of six” poster presentation. Annual Meeting IADVL Maharashtra branch, Jan-2004 Nashik. DERMACON 2005 33rd National Conference of IADVL, Jan 2005 Delhi. 1st Paediatric Dermatology meeting , Nov – 2004Chennai. National Conference of IADVL, Jan 2004,Mumbai. Pre conference workshop in DERMATOSURGERY Jan 2004 Mumbai. Pre-Conference workshop in COSMETIC DERMATOLOGY Jan 2004 Mumbai. 2nd International CME on Dermatopathology, Nov 2003.New Delhi. A.C.Parikh award, oral presentation Annual Meeting IADVL Maharashtra branch, Jan-2004 Mumbai. 1st prize for “Chloracne in a family of six” poster presentation. Annual Meeting IADVL Maharashtra branch, Jan-2004 Nashik. Visiting Don-Bosco shelter, every month. Participated in Diwali Mela for street children,2003-2004 Don Bosco school. Participated in Health camp , Feb-2004 Kalina. Participated in Health camp organized by Kirit Somaiya, 2004 Govandi. Participated in Health camp organized by Manohar Joshi, 2004 Antop Hill.